UWE SCHOLZ was born in Jugenheim/ Germany on December 31, 1958. At the tender age of 4 he took up ballet classes. Two years later he moved on to the Landestheater Darmstadt for training. At that time he also started piano lessons. He began to train his singing voice at the State Academy of Musical Art in Darmstadt. Later on he also took up violin and guitar classes. Ten-year-old Uwe Scholz dreamt of becoming a conductor. Nevertheless, a growing fascination for the multitudinous ways of expression in dance seemed to prevail. At the age of 13 - and one month before Jon Cranko's tragic death -, he was admitted to the Stuttgart Ballet School. It was Marcia Haydée above all who became his lifelong mentor. She started, influenced, and shaped his artistic career. 1976 saw Uwe Scholz' first choreography "Serenade for 5+1" with music by Mozart. Uwe Scholz then worked in London. He received a scholarship grant for the prestigious Balanchine School of American Ballet in New York. In 1977, he returned to the John Cranko Academy in Stuttgart to pass his exams in 1979. Uwe Scholz moved on to become a dancer with the Stuttgart Ballet. From the very beginning of his dancing career Marcia Haydée entrusted him with a range of choreographic assignments. 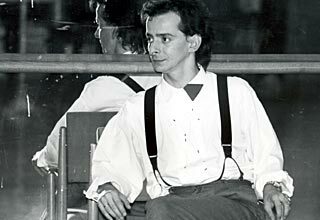 In 1980, Uwe Scholz became resident choreographer with the Stuttgart Ballet. He concluded his dancing career except for a much noticed solo in a choreography by Maurice Béjart. In the years to come Uwe Scholz not only produced choreographies for ballet. He was also an opera director (Testimonium Festival in Israel, and "The Magic Flute" in Nuremberg), a choreographer for opera (with Lovro von Matacic, and also with Hans Neuenfels for "Aida" in Frankfurt), and an Assistant Director for film and drama (with Heyme). At the age of 26, Uwe Scholz became artistic director and chief choreographer of the Zurich Ballet. After 6 years in Zurich, he returned to Germany to build and shape the Leipzig Ballet until his tragic and untimely death in 2004. During his impressive career Uwe Scholz created more than 100 choregraphic works. His main focus was always the score... He loved works by Bach, Bruckner, Mozart, Wagner, Schumann, Schubert, Stravinsky, and Bartok as much as contemporary compositions by Udo Zimmermann and Pierre Boulez. For his lifetime achievements Uwe Scholz was awarded the "Ommagio Alla Danza" of the Dance Organisation "Espressione Europa" in Venice 1987. In 1996 he was presented with the German Cross of Merit by the then German Federal President Roman Herzog. For his choreography "The Great Mass" (premiere 1998 in Leipzig) he was awarded the Theaterpreis of the Bavarian State Government in 1998. Uwe Scholz also received the German Dance Award in Essen in 1999. 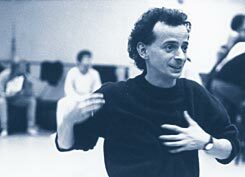 Uwe Scholz worked as the artistic director and chief choreographer of the Leipzig Ballet from 1991 up to his tragic death on November 21, 2004 following a severe illness. With - and for - the Leipzig Ballet he created an outstanding body of works - among them Haydn's "Creation", Mozart's "Great Mass" (now on DVD), "Pax Questuosa" by Udo Zimmermann, Berlioz' "Symphonie Phantastique", "Red and Black" based on Stendhal's novel, Interpretations of Bach, as well as Symphonies by Bruckner, Beethoven, Schumann, and Prokofiev.